I served in the Welsh Guards during the latter part of the 1914-18 War, and was in France (as a subaltern) on the Western Front with the first battalion of my regiment, and took part in the big push that smashed into the Hindenburg Line in August 1918, when I collected some lungfuls of poison gas (our own, chiefly, for we were far ahead of our barrage in the attack when I was knocked out) and invalided home. It’s necessary to tell you all this, as what I experienced in the army and on active service had a profound effect upon my imagination, and to some extent coloured my fiction when I wrote short stories and novels after the Great War. (Engraved on one of the routine medals I collected, suspended from what was known as “the Victory ribbon,” are the words: “The Great War for Civilisation”. That’s a laugh, in view of the sort of civilisation we’ve had ever since!) (1995 reprint, 9). The question how far his war experience coloured his fiction is one that Stableford addressed in his article. Gloag’s essay Artifex; or, The Future of Craftsmanship (1926) was clearly influenced by his Great War experience. Like The People of the Ruins by Edward Shanks and Cicely Hamilton‘s Theodore Savage, both of which he mentions, he was convinced of the fragility of civilisation. His own conclusion was the “we realise with something of a shock how absolutely dependent we are for our present security and comfort upon the skill, individual and coordinated, of craftsmen” (quoted Stableford 10). In his first novel, Tomorrow’s Yesterday, he explores this theme from another angle, and has his future felines witness a destructive war and the reversion of mankind to barbarism, just as in the books by Shanks and Hamilton. His second novel, though—just as delicately ironic as the first, Stableford notes—goes in an opposite direction. In The New Pleasure heightened senses of smell lead mankind “to a new promised land, leading to much greater discrimination even in sexual relationships, promoting an entirely natural eugenic selection hat reduces the population greatly” (Stableford 12). As the inventor of this new drug travels up the Thames at the end of the book, just as Guest does in William Morris’s News from Nowhere (1890), “he reflects that the new England he has been instrumental in creating would resemble the picture painted by William Morris in News from Nowhere, were it not for the fact that the architecture of this new world is so much more magnificent” (Stableford, 13). The lyrical celebration of the re-establishment of harmony with nature, Stableford comments, has resonances with much more recent American science fiction; but, as with the recent fiction, Gloag’s utopianism arises out of a sharp dissatisfaction with the contemporary post-War world. 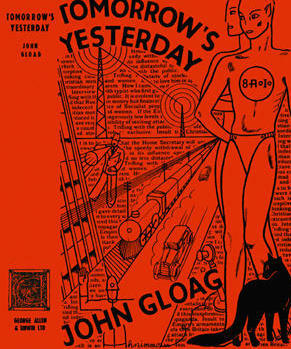 For all this, see Brian Stableford, “The Future Between the Wars: The Speculative Fiction of John Gloag”, Foundation: The Review of Science Fiction 20 (October 1980), 47-64 (reprinted in Stableford, Algebraic Fantasies and Realistic Romances (San Bernardino, CA: Borgo Press, 1995), 7-24.